The NHL reminds me often that it is a joke of a league. Matt Cooke hospitalizes Marc Savard and gets away without punishment. The Atlanta Thrashers -- the Rangers' opponent that is arguably in a playoff hunt -- totally embarrassed itself with its performance at home by getting beaten by the Ranger 5-2. Nearly the entire lower bowl of Phillips Arena was empty for most of the game before people sneaked down near the end. The last time the Rangers were there, a one inch snowstorm had shut down the city and hardly anyone showed up for the game. I wonder what the reason was for Friday's no-show -- perhaps the performance of crappy teams don't measure up to what people saw on the Olympics. This may be the reason that Brainiac Bettman does not want NHL players in the Olympics -- those games expose how crappy the NHL is (after you get past the top 6 teams) generally with the dilution of talent thanks to misguided expansion. The gap between the teams in playoff slots and those trying to get in is illuminating. Prior to the Thrashers game, nearly every team outside the top 8 in each conference were in the midst of losing streaks including Atlanta and the Rangers at 4 and counting. But back to the game . . . the Rangers are in playoff contention . . . the Rangers website labeled the win as a "Runaway Victory." Official recap is here. The question is runaway from what? The game was absolutely terrible. 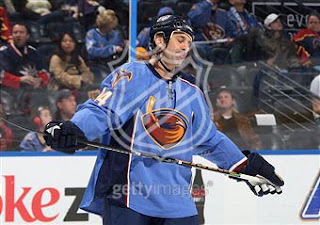 The Thrashers, now mired in a 5 game losing streak, handed the game to the Rangers in the first period. Atlanta had lost the night before in Tampa and the Rangers jumped on them, apparently taking Coach Tortorella's new emphasis on "Structure" to heart. 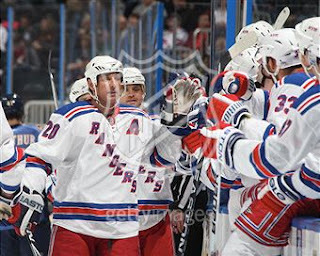 The Rangers, if they wanted to make a statement game, should have won this game by a score of 7-1. Instead, they spent the night in danger of blowing a 3 goal lead because of their inconsistent play. Early in the first period, Vinny Prospal shot a laser that Thrasher goalie Johan Hedberg whiffed on. Hedberg had good success in his prior starts against the Rangers but he was not finished in perhaps torpedoing the Thrashers' season. Immediately after that -- 9 seconds after that goal, in fact, he slapped a puck into the stands for a delay of game penalty. 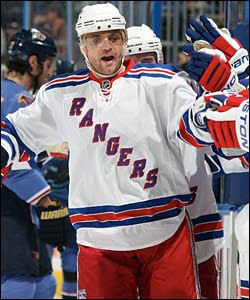 The Rangers converted as Hedberg got his footwork tangled up and could not stop Marian Gaborik who converted a nice cross-crease pass from Chris Drury to make it 2-0. Showing an unusual desire to end the game early, the Rangers continued to pressure and were rewarded with 2 more power play opportunities including a 5 on 3. They failed to convert there but during the remainder of the second penalty, Prospal scored his second of the game and the Rangers had a 3-0 lead. Then the Blueshirts essentially took the rest of the game off and if Atlanta had any talent, now depleted by the Kolvachuk trade, the Rangers would have paid a possibly fatal price. Atlanta picked up its game after the 3rd goal and as usual, the Rangers defense let numerous Thrashers rush the net or get behind the defensemen only to be thwarted by Henrik Lundqvist who was much sharper than the Devils outing. Atlanta narrowed the score to 3-1 early in the second period and definitely had the advantage in even strength play. That goal occurred when Artem Anisimov, helping to kill a penalty, led a rush into the Atlanta end, fell and lost the puck. The Thrashers zipped up the open ice, essentially on a 5-on-3 run and converted. But shortly after that, either because of a dearth of talent or exhaustion from back-to-back games, the Thrashers abandoned the attack and started playing conservatively. The clock kept running and the desperation started to fade. 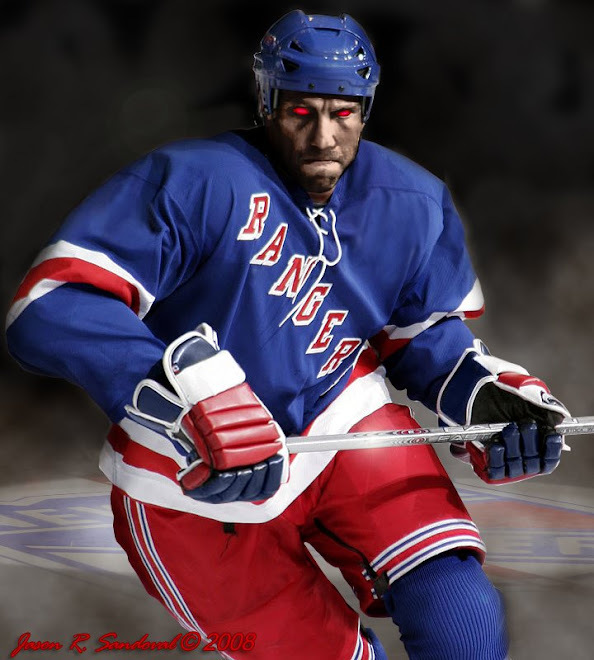 Meanwhile, the Rangers were able to recover and play a steadier defense. But you knew that if the Blueshirts had been playing a team with a quality offense, they would have been swept out of the building. Luckily, the Rangers were not playing the quality of competition they had lost to all last week and late in the 2nd period, Gaborik fed Michael Del Zotto a pass on the left side and his shot deflected off a skate into the net for a 4-1 lead heading into the final period. In the 3rd period, Atlanta again mounted a renewed attack and were able to score in the final 8 minutes of the period. On that goal, the Rangers had all 5 skaters on the left side of the ice leaving their goalie at the mercy of Ron Hainsey. The Rangers decided to make the game even more interesting when Jody Shelley took a hooking penalty a couple of minutes later. But the Rangers persevered and killed the penalty. Atlanta pulled Hedberg in the final minutes and Johnny Oduya, one of the Devils Atlanta got in the Olvachuk deal, made a horrible cross ice pass to no one in his own zone and skated after it like Ales Kotalik skated after he screwed up another Ranger power play. Meanwhile, Ryan Callahan, reminding me of when he outraced Martin Brodeur to the puck in the 2008 playoffs, beat Oduya and and slapped the puck across the ice into the net for the final goal with a minute left. Before the game, Torts benched Sean Avery, who has been emasculated thanks to the league, the refs and the coaching staff. It's not surprising that his play has deteriorated but part of that is also on him because he has not stayed true to his own style. Also, with this nonsensical talk about Structure, how long did it take before Tortorella started changing lines in the game -- 2 shifts? And say what you want about former coach Tom Renney's boring style, you did not see the Rangers panicking in their own defensive end, leaving players unmarked, having the entire team on one side of the ice, etc. like they have this season. There is truly no lead safe in their hands. There is no Structure to this team -- players have no idea who they will skate with, some do not know their roles and there is no accountability. We will see how the Rangers now do with their next 3 games at home -- Philly, Montreal and St. Louis. By the end of the week, it will be clearer what the Rangers' playoff chances are. It's not worth speculating because only wins will do from here on in.